Are You ready to step into your Passion and Purpose? streams of revenue to support you! Do you have a Healing or New Earth Service? Would you like to live your passion? Do you need help finding your Passion Flow? Would you like to quit/change jobs? 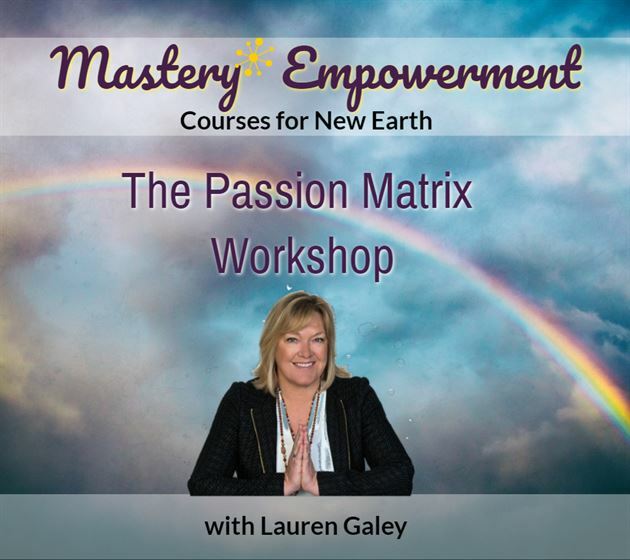 Learn how to Create Your Own Passion Matrix in this live online event that allows you to bring forth your New Earth Creations, Services, Products, Systems, Organizations while being fueled by your passion and utlilizing all of your skills and talents that bring you Joy! Passion Flow is the New Cashflow! Hello my New Earth Co-creators! In my own personal journey of creating a service that brings out my heart-felt passion, I discovered I have a knack at creativity for New Earth services, systems and products, and helping others find creative expressions of passion while using all the talents and skills one has gained on this journey and all incarnations. As we move from the old 3D old Earth structures, systems and paradigms, and step into the higher frequencies of the 5th Dimension and Unity Consciousness, we will use these energies or state of consciousness to create with. I will show you my technique that I used to allow my passion to take priority in my life, creating a self-sustainable income , while serving others. If this is your mission too, then this technique will assist you here and now. We’ll take a meditative journey into our Sacred Heart Temple, where we’ll review and explores skills and talents of this lifetime along with past and future lives. We’ll add this to our Passion Matrix and begin to weave an action plan fueled by your passion. Join me to jump-start your New Earth Creations in 2019! First, we’re going to talk about passion. Are you really living your passion or do you just think you are? We’ll take a mediative journey that helps you discover and identify your many passions, even looking at what you loved to do as a child, and those things that you do where you get lost in time. Then we’ll do a list-building exercise which identifies your skills and talents, including writing, singing, dancing, sports, office work, typing, knowledge and efficiency with various software programs, cognitive abilities, business experience, any planetary experience you are great at and anything you know and perform like the back of your hand – you will list everything you are extremely efficient at it and you enjoy doing. With these two exercises in place, you’ll have a map in front of you in which you’ll Heart-Storm (brainstorm) about how you can weave a new Matrix of all your skills, talents and passions into something that you can monetize, earn an income from, and be rewarded for in an energetic exchange for your Service to Humanity and the Universe. This may be revealed immediately, or it may be revealed over time, in big or small doses. Regardless of how it unfolds, it will unfold, because it will be a creation of your Heart. Your Passion. And it will tune you in to your Authentic Self, doing that which makes your heart sing. And being provided for along the way! Create a Passion Matrix: List building exercises and meditation to discover yourpassion, skills, talents and all things you do with great ease, efficiency and joy.